Show your ring bearer how important his role is on your big day with this backpack gift. This cotton and nylon backpack measures 4" x 9" x 10". It is black with nylon bordering and two adjustable nylon straps for hanging on the back. Each back strap is adjustable to a maximum of 18.25" long. 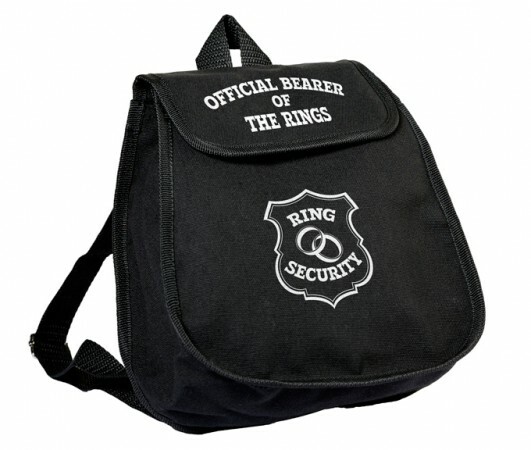 The top flap of the backpack has a Velcro closure and is decorated with the words "Official Bearer of the Rings." The body of the backpack is decorated with the words "Ring Security" in white.